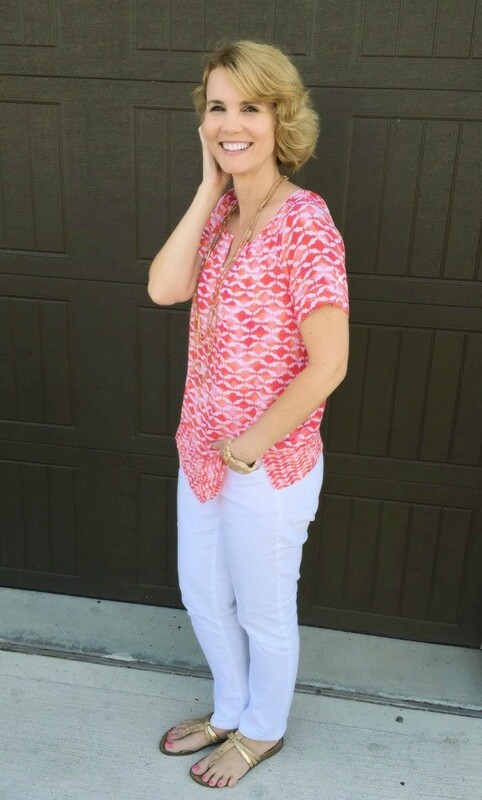 What do you get when you pair white denim and a coral shirt from J. Jill’s beautiful June collection? An instant outfit idea perfect for summer BBQ’s, get-togethers or outings with the family. This will most likely become one of my favorite outfits of the season. I’ve never owned or even tried on a pair of J. Jill’s denim before and I can now say – I am hooked! The ones I’m wearing are their Authentic Fit Ankle Jeans in white. I usually wear size 4, but am always nervous when ordering jeans online – because you just never know how they’ll fit! These are true to size and the 4 fits so perfectly in all the right places. I love the length, the fit in the waist, thighs and booty. They have a little stretch in them, which I have found is a must when it comes to my denim. 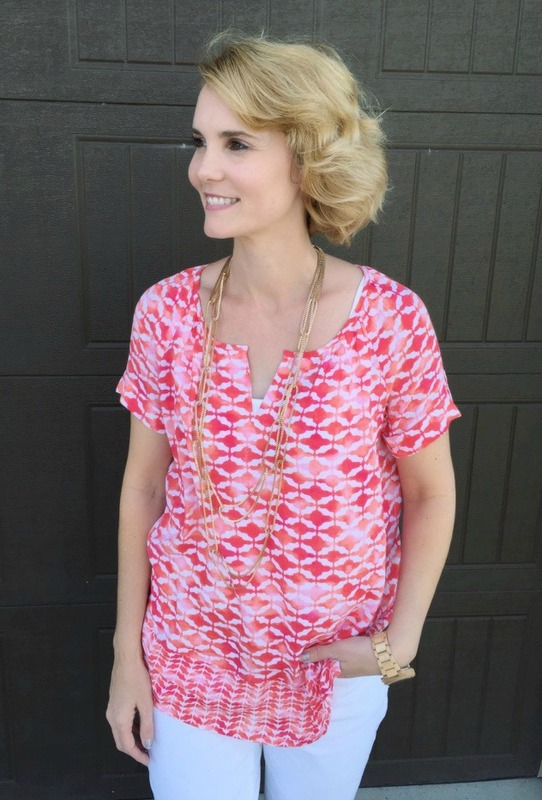 The top is their Geo Print Peasant Top in Papaya (or coral if you will). It is so lightweight and comfortable, with a stunning print and color. Plus, there’s the details – split neck, cuffed raglan sleeves with a button and a smaller scale print with vents on the bottom. They also have this top in moss, but the papaya color had my name written all over it. I added a long gold chain, my go-to gold sandals and my wood watch you’ve seen me wear over and over again. J. Jill’s June Collection is all about helping you relax and unwind with their airy fabrics that are as light as can be. You’ll see an assortment of styles in palates of pink, coral and orange, moss green and classic neutrals. Not to mention the gorgeous embroidering and bead-work. There’s a dress from their June collection I’m featuring next week and the bead-work is stunning! Is this an outfit idea you would wear? Do you have a pair of go-to denim? I do believe these are officially my go-to pair. Local friends, you’ll see me in these all.summer.long. Disclosure: Mom Fabulous was provided with samples to facilitate this post.